14k Yellow and White Gold Fancy Link 26 inch Necklace By Leslies. Home | Ladies Jewelry | Bargain Priced Necklaces and Chains | 14k Yellow and White Gold Fancy Link 26 inch Necklace By Leslies. Linked in loveliness! This fancy necklace goes with positively everything. 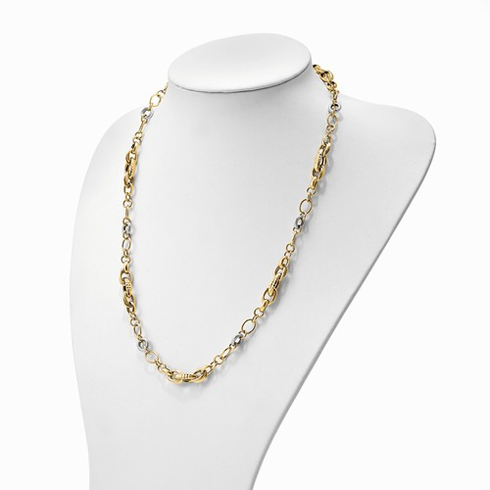 Crafted from 14K yellow and white gold, this piece features an interlocking link chain. An easy accessory to wear with your other favorite gold jewelry or by itself! Leslies 14k yellow and white gold link 26 inch Necklace. Average weight is 21 grams. The necklace is secured with a fancy lobster claw clasp. Lifetime Guarantee. Made in Italy. This product is part of Leslie's Premium Gold Collection. Each piece of Leslie's brand jewelry comes with a lifetime gold guarantee. The guarantee only covers the piece if it is accidently broken, damaged or is defective. We will replace the item with the same item unless it is no longer available. If the same product is no longer available, we will substitute a product of similar design and value. You will also receive with this product an appraisal certificate valued at the suggested retail price. The suggested retail price is $3217.